﻿ Directions. Find Us at Beachwalk Bed and Breakfast. Accommodation in Summerstrand, Port Elizabeth. Port Elizabeth, affectionately known as the 'Friendly City', is situated along the Sunshine Coast South Africa. From here one can travel along the R72 to Kenton-on-Sea, Port Alfred and the Wild Coast; through Frontier Country to Grahamstown, or along the Garden Route to Cape Town. Beachwalk Bed and Breakfast is situated about 60 metres from Port Elizabeth's beautiful beaches and within easy walking distance to The Boardwalk Casino & Entertainment Complex. 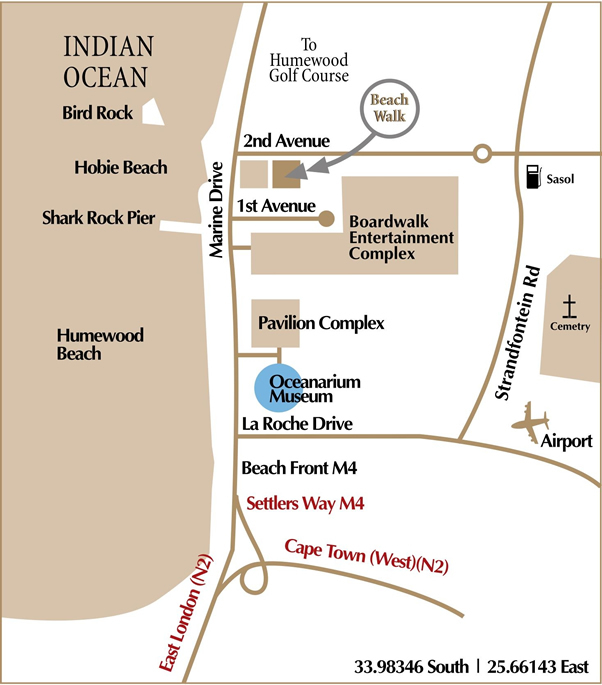 Carry on along Beach Road which becomes Marine Drive, past Paxton Hotel, Virgin Active, Mac Donalds, to the Boardwalk Casino complex. At the first set of lights after the Boardwalk, turn right into 2nd avenue - Beachwalk is the 1st house on the right. Carry on down Second Avenue - Beachwalk is the last house on the left before you hit the beach.